Almost 19 years since the closing and demolition of the Biff-Burger in Hummels Wharf, many people still remember the Biff-Burger with the fondest memories. In 1965, Leon Pontius, the owner of a boat dealership in Hummels Wharf was looking to open up another establishment. After looking at the portable pre-fabricated metal facilitites that a Clearwater, Florida based company named "Biff-Burger" offered, he introduced the first fast food restaurant along Route US 11 & 15 directly across from his boat dealership. 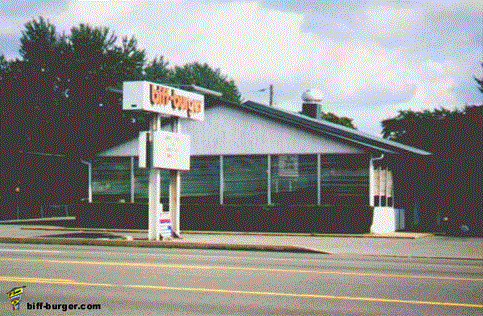 The Hummels Wharf Biff-Burger as it appeared shortly before sale and demolition. The sign in front is a replacement for the sign that stood for years, such as is modeled below. Mr. Pontius was also interested in opening up a second Biff-Burger in the nearby town of Sunbury, across the river from the Hummels Wharf location, however it never came about. The Biff-Burger story started in the mid 1950's when Biff-Burger was a growing chain of drive-up burger stands that stretched primarily from Florida to Toronto, Canada. Another note of interest is that in 1973, the only fast food competitor on the "Golden Strip" in Hummels Wharf and nearby Shamokin Dam was a Carrols -"Home of the Club Burger". McDonalds opened their doors one year ater in 1974 and Carrols later became Burger King in 1976. The Biff was known for its charbroiled taste and sauce that it was dipped into after broiling. The Roto-Red R-22 Broiler had two circular racks. The burgers would be made on the top rack adn the juices would drip onto the buns, placed on the bottom rack. Mix and ENJOY! This will make a small batch but Biff-Burger owners used to make it in 5 gallon buckets. Bruce and Earl Brane, were the original owners of the Biff-Burger Company and opened their first restaurant location in Clearwater, Florida in 1956. The Brane brothers designed and built the broilers at their manufacturing warehouse. Bruce acted as the president of the Biff-Burger Company and ran the dy-to-day business in addition to creating the menu and special sauce that former customers remember so well. This infra-heat, similar to the heat radiated from glowing quartz tubes in space heaters, is used to broil and toasts each sandwich exactly the same. After a few minutes, the cooked 100% beef burgers and toasted sesame seeded buns came out the other side of the covered broiler and ready for dipping into the Biff-Burger's special sauce. The Special Sauce, another signature of Biff-Burger, was warmed in a warming pan adjacent to and to the left of the roto-broiler. When the burgers taking out of the roto-broiler, each burger was then dipped into the sauce warming pan whereby coating the burger with Biff-Burger's signature special tangy sauce, cade of 27 spices, before being placed between two buns and fixins added. "Beef Burger" located in Greensboro, North Carolina, is a restuarant that was former a Biff-Burger and is still called that by many of the locals. They still use the "Roto-red" Roto Broiler to grill the burgers and toast the buns before a quick dip into the sauce that owner, Ralph Havis, claims to be from the original recipe obtained from when he purchased the West Lee Street Greensboro location from one of the original Biff franchise owners. Only one Biff-Burger, which still bears the original name, sign, and multicolored "Port-A-Unit" building with canopy overhang, still survives to date in St. Petersburg, Fla. The establishment is also a well known national hangout and meeting spot for bikers and hot rodders alike. Hot rods and street rods cruise Biff several evenings throughout the week. Sign at the St. Petersburg, Fla. Biff-Burger. this design was featured at the Hummels Wharf Biff-Burger until 1974, when it was struck by lightning and replaced. 1965 Original Owner: Leon Pontius, 19¢ the cost of a burger at Biff-Burger. 1972 The year a dine-in seating area was bult. 1974 $1.35 The cost, in dollars, of a loaded "Super Biff with Cheese", and order of french fries and a small soda. 2000 $3.39 The cost, in dollars, of a loaded "Super Biff with Cheese", and order of small fries and a soda. The original building was a Port-A-Unit, a portable metal facility, which featured a 'walk-up' and 'pick-up' counter service while table seating was provided outdoors. The customers ordered from one window and picked up their food from another one after their number was called. The days of 'in-car' and outside table dining gave way to a seating area built at the front of the building shortly after the Hurricane Agnes flood swept the area in 1972. National Biff-Burger System's Franchise Opportunity booklet claimed the capacity of the Roto-Red is rated at over 500 uniformly brolied hamburgers and toasted buns per hour. This is an image of an original framed print of an artist conceptual sketch of the proposed Port-A-Unit structure and the site layout of the drive-in, provided by the late Doug Brane, son of co-founder Bruce Brane. Copyright © 2010 The Snyder County Post Co. All rights reserved.